Some days, the Atlas Line from DayTradeToWin.com can do no wrong. The above picture is from one of those days. A short signal was generated at the close of the 9:55 a.m. candle. Price proceeded bearishly from there into potential profit territory. If you held the trade, you likely would have had a winner on your hands. Because the profit target is based on the ATR and the ATR was around 2.5 at the time of the signal, you could have walked away without about 2 points in the bag. If you want to configure the ATR similarly on your charts, use a period value of 4. The Atlas Line can also produce Strength and Pullback trades, but we did not see any here. ATO 2 users saw an additional short opportunity that likely resulted in another winner. Sometimes, it’s helpful to “zoom out” to see what the overall picture looks like. Use a daily chart every now and then. A recent high was reached on Nov. 30, 2017. That activity may be the start of a move down, followed by another move up, according to the January Effect. Very soon, we would be looking at one of the last January Effect trades that remain for 2017. If you have been considering purchasing the Atlas Line, now may be the best time to do so. The DayTradeToWin.com website has shown a number of promising trades recently. Of course, there is always room for major financial loss, so only trade with non-essential, high-risk account funds. There are hundreds, if not thousands of commercially available indicators for NinjaTrader that claim to provide accurate entry signals. The Atlas Line from DayTradeToWin.com is one of them. Instead of showing you a simple web page with a couple of charts to convince you of this, the DayTradeToWin’s website contains dozens of trading videos showing the Atlas Line being traded in real-time conditions. Furthermore, the Recent Trades page provides an overall picture of simulated performance. Within the first half-hour of market open, the Atlas Line typically plots a long or short entry signal. The signal basically tells you that it’s time to place a trade because the market is expected to head up or down. In previous versions of NinjaTrader, this was known as a Double Bar signal. For the updated NinjaTrader 8 version, these are the regular signals prefixed with “Atlas.” The entry signal text plots as the entry bar closes. You can predict exactly when a trade is about to appear based on the position of the line vs. the candlesticks. If there are two consecutive bars above the line, then a long (buy) signal will appear when that second bar closes. Inversely, the same is true for short signals. The angle of the Atlas Line is static throughout the entire day. Some traders prefer to add a second Atlas Line around noon, US/Eastern time, to find trades in the afternoon. Other signals are included, such as Strength and Pullback. Think of these as smaller, follow-up trades to the main signals. A specific candle pattern must appear for these trades to be confirmed. On the chart, look for the small S and P signals. Optionally, users can enable the separate bounce trades. This happens when price “bounces off” the line. In terms of configuring the software, it’s straightforward. Other than aesethic color choices, the main option is the Market Open time. Like the ATO, set this to the time the market opens. It’s normal for signals will appear later. Like other DayTradeToWin.com products, live training is included. You will be taught how to use the software directly by John Paul. He also answers all trading-related questions. A recent update to the NinjaTrader 8 Atlas Line allows users to change the color of the Strength and Pullback signals. In addition, it’s now possible to change the background color for these signals. This is helpful because it seems like half of Ninja’s users like dark charts, whereas the other half prefer traditional white. Currently, two platforms are supported: Ninja and TradeStation. Support for thinkorswim, MetaStock, and MetaTrader would be a definite improvement, although the licensing features of these other platforms tend to lack compared to Ninja. Have you seen the latest Atlas Line E-mini trading video? John Paul combines the Atlas Line’s signals and indication of expected overall direction with the ATO 2 software. As the market opens, buyers and sellers typically become more active and push the market in a specific direction. This trend may be short term, but the Atlas Line often generates a signal around the time of the peak of this activity. Yes, within the first 30 minutes from market open, you can usually expect an Atlas Line signal. As a complimentary trading system, the Atlas Line can be used to filter out potential bad trades. When price is below the line, short trades are advised. The inverse is true with long trades. Many traders depend on the Atlas Line’s signals daily as a sole driver of trades. Generally, users can expect two to four trades on average daily. This includes the additional Strength and Pullback signals. A sound alert can be configured for the main signals. If you’re away from the computer or working in a different program, you can go to your charts and place an order. NinjaTrader’s ATM Strategy is very useful. It lets you pre-define profit targets and stop losses. When you enter a trade, the profit and stop are automatically placed for you – no need to hurry and potentially make mistakes. If you’re serious about learning the pros and cons of trading, you need to take time to practice. With purchase of the Atlas Line, you can request a copy of the NinjaTrader 8 trading software. This charting platform can be used for real-time practice. It’s true that this type of practice is not the same as real-money trading, however, it’s probably as close as you’re going to get for free. Once you begin live trading, your knowledge of the platform will fall into place. Because trading can be stressful, you don’t want to click the wrong button at the wrong moment and be out hundreds or thousands of dollars. Fortunately, NinjaTrader has a feature called ATM Strategy that lets you predefine a custom profit target and stop loss value. Before placing a trade, you can select the ideal ATM Strategy for current market conditions. For example, if the ATR is often around two points, that means the Atlas Line profit target is often two points. It’s probably a good idea to set up an ATM Strategy with a two-point profit target. 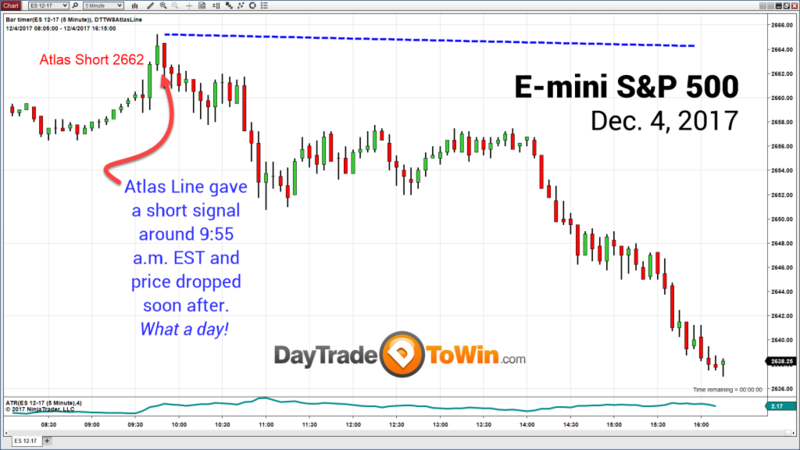 In the video above, the Atlas Line produces a two-point winner on the E-mini S&P. Not every trade will be a winner. The goal is to have more winning trades and have profits exceed the losses. Industry regulations require the disclosure of hypothetical results. We encourage each student to do thorough experimentation and consultation with a license broker and finance expert to ensure you can afford to day trade. Many people get the idea to quit their job or find themselves in a financial bind. In this case, it may be best to find a traditional and reliable source of income, build up risk capital, then trade with this loss-ready money when the time comes. This apples to futures, forex, stocks, and whatever other type of instrument you want to trade. Day trading signal software comes and goes. The Atlas Line has stood the test of time. 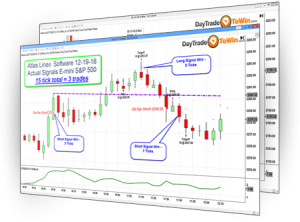 Hundreds of traders use the software on a daily basis for a reason. Simple and effective.